MusicWonk is a MIDI program that produces MIDI music based on algorithmic rules that you interactively create by connecting modules (graphical objects that represent functions and processes) in real time, adjusting the parameters as you go, in an interactive drag and drop environment especially designed to be fast to learn, fast to use. But MusicWonk did not achieve its ease of use by dumbing it down. Quite the contrary. With a starting palette of over 200 built in modules and functions, MusicWonk is one of the most powerful algorithmic composing programs available. MusicWonk will drive MIDI synthesizers, soft synths and sound cards directly, effectively "playing" them in real time; it will also record directly to a standard MIDI file. MusicWonk is essentially the same program as ArtWonk, but without the animation graphics components. It is the successor to a long line of graphical, modular, and interactive algorithmic composing programs created by John Dunn that were inspired by the big analog modular synthesizers, going back to one of the first if its kind ever produced for MIDI, MusicBox, released to the public domain in 1986. While you can easily create analog synthesizer style step sequencers with MusicWonk, it goes far beyond its sequencer roots, to give you algorithmic composing tools of all kinds. 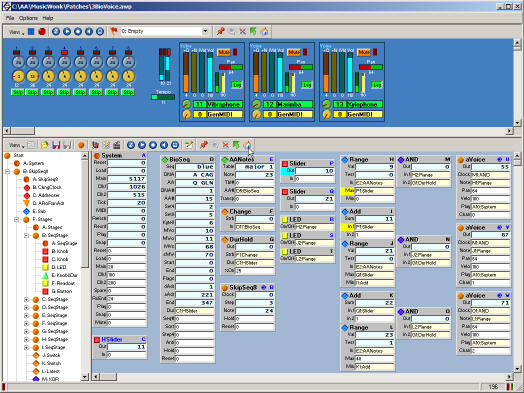 MusicWonk is essentially a program language specialized for creating music, intended to be used by musicians. It is not a text based language like Java, C, or Lisp; instead it is a visual direct manipulation language that does not require you to take weeks to months to learn. You simply select graphical modules from a pop up menu, drag and drop their connections and interactions, listening to the results in real time as you build and modify your piece.